Time is irrelevant at La Mamounia. Here the past blends with the present and days are punctuated by the sound of birdsongs, soothing argan oil massages, and candlelight tete-a-tete dinners. Not, the tick of a clock. A favorite of the world’s elite since 1923, La Mamounia is where Winston Churchill escaped the pressures of war by painting the Atlas mountains from his suite, and where today’s international business moguls, sports stars, and artists mingle within Jacques Garcia designed interiors and under the shade of 700 year old olive groves grown for a Moroccan prince. Ideal location 10 minutes drive from the airport and 5 minutes walk from the Jamaa El Fna Square. Complimentary transfer from and to Marrakech Menara Airport starting for the Prestige Suites, Signature Suites and Riads. It was an absolute dream. We felt like we were in paradise. We greatly appreciated the kindness of the guest manager. He did a great job of understanding the trouble of our friends who were to travel with us. He is an incredible professional and person in my opinion. The excellent service &amp; hospitality of the restaurants in particular stand out the most. This hotel is now a regular for myself and my wife - the service and facilities are second to none and makes other hotels we have stayed at seem very second rate. A magnificent hotel with a peaceful atmosphere. The staff is formidable and really care about their customers and they’re incredibly friendly. In one word perfection. Fabulous, great and efficient staff, always available to help you out. Magnificent, a serene place with a wonderful garden. There were very few people in the hotel, so we were able to make the most of it. It's a charming hotel one of the places you have to go at least once in your lifetime. I think that the light system in the bedrooms is a bit complicated and a bit too dark. For ladies that have to put makeup on is a little bit uncomfortable. An incredible place that lives up to its reputation. Everything was perfect. What I loved the most, was how every single staff member takes the time to smile and say hello whenever they walk by. You’re made to feel at home and I asked the General Manger to convey my impressions to his staff. This level of service is what makes me choose this Palace Hotel over every other. It was perfect. They even remembered my birthday, and brought me cake and Champagne in my room. Very kind people! A very beautiful hotel that met all of our expectations. Jacques Garcia’s influence is immediately evident. The Sommelier is very competent and we had a great conversation on the characteristics of Moroccan wine and he made us discover a few gems. We had a very good experience at the Moroccan restaurant. 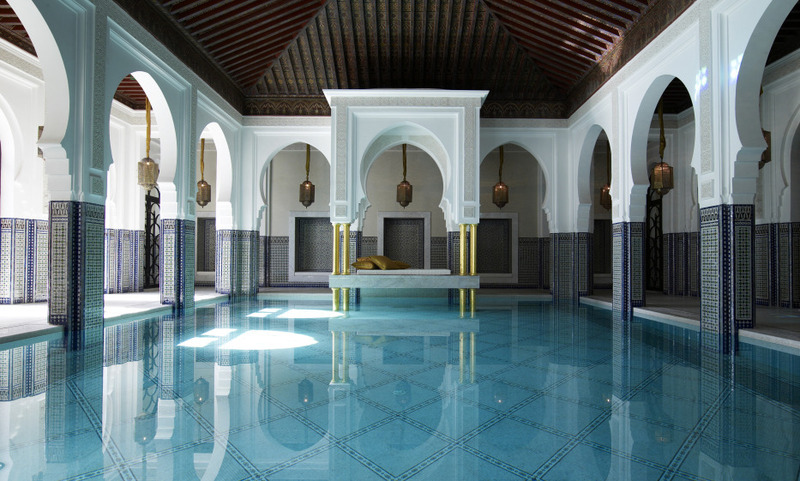 La Mamounia is a historic hotel and a peaceful haven where one feels good. The high quality service is both courteous and discreet. The traditional decor and relaxing garden helps to create a peaceful environment that makes you want to come back. One of the best hotels I've been lucky enough to experience. Calm and friendly atmosphere and great views from a well equipped and nicely decorated hotel room. One of the best! It's a place of serenity and relaxation and this is the 12th time that i've come to stay. It is a fabulous hotel. The grounds are spectacular. The sounds of the birds in the trees were marvelous. The service was incredible. The pool is breathtaking. I could not have been more pleased with my stay at La Mamounia. If there was anything to complain about, it was a long walk from the elevator to my suite. Minor, of course, but I'm trying to find something to criticize. For sure one of the best hotels in the planet. It is the ultimate experience for enjoying Marrakech in an environment of elegance, charm, tranquility and above all, in peace. It is as if time stops and we are taken to another dimension: just perfect. It’s always a magical experience. From the welcome to the beautiful rooms, everything was set up for the perfect stay. The complimentary champagne and treats in our room contributed a lot to the experience. Excellent hotel, an icon in Marrakesh history. Impeccable in every way: location, decor, cleanliness, luxury, and especially service. The staff were helpful, always ready to meet and help customers in every situation. A wonderful experience that we look forward to repeat. We enjoyed everything. Please, do not change! Very nice hotel, beautiful grounds and gardens. Liked the ice cream shop! Always a beautiful hotel, a dreamy atmosphere, although a bit tainted by the presence of people from outside who come to visit the hotel or enjoy the pool during the day. A stay at La Mamounia remains an enchantment however! And the service is irreproachable. The staff try very hard and are mostly fabulous. The pool is fabulous. Overall excellent. Very great hotel, but very expensive!! World Class! We shall definetly return. Its a stunning place, nice garden, friendly staff, nice decorated rooms, good food, service very high, Nice fitness area, very nice breakfast, next time we want better weather, we had a great stay,- and will say thank you to all staff, We will come back. Thankyou. We wish all a mery X-mas and a happy new year. We spend a great time, but we were disappointed because they stopped the buffet for the lunch. Also the italian restaurant is average for a hotel of this status. The stay at La Mamounia was a memorable one. However, rooms overlooking the Koutoubia are very noisy. The hotel is beautiful. Our only disappointment was the Moroccan restaurant. It was very overpriced and the food and service were not up to the price tag. A fantastic welcome, particularly with regard to the birthday of my husband. An unforgettable stay. Exceptional hotel. Overall quality largely up to the myth &quot;La Mamounia&quot;. Beautiful hotel. Exceptional garden. Friendly staff : friendly, dedicated, responsive. A wonderful stay. Magical place with efficient and attentive service as it should be in a hotel of this category. Restaurants good but too expensive. Stay to renew both for the quality of the hotel and for its location. Beautiful and peaceful garden! Clearly one of the best place in the world. A paradise, beautiful, perfect, attentive, friendly. Beautifully decorated, brilliantly remodeled by J.Garcia.